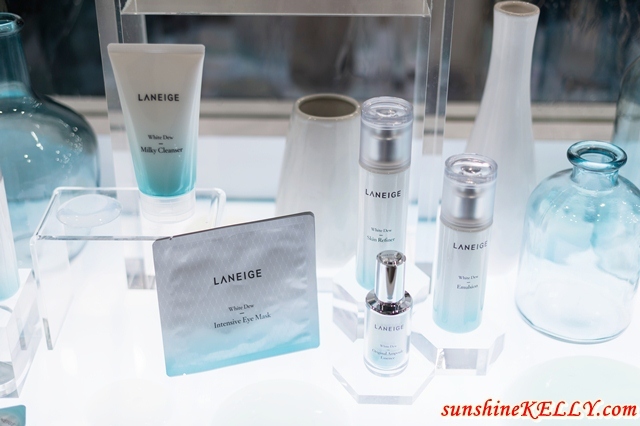 Well recently LANEIGE unveiled its White Dew skincare line and new range of Silk Intense Lipstick shades. They are out on a mission to unleash the Sparkling Beauty in Asian women. Improving our skin tone is #missiondewable with LANEIGE’s new White Dew, the world’s first patented moisture whitening skin care line. LANEIGE Global Make Up Artist & Trainer, Cat Koh was here for makeup demo. 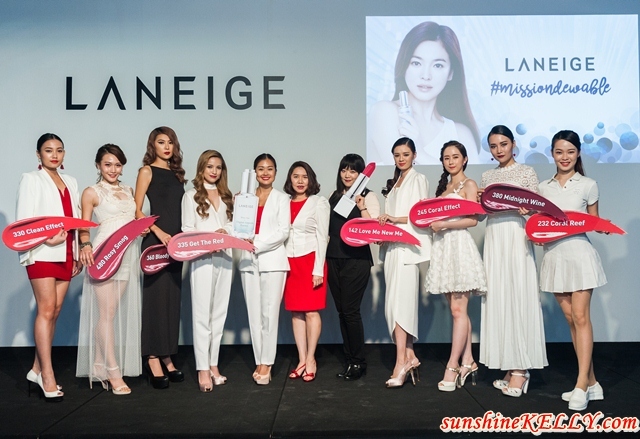 All eyes on her as she made her entry with eight models wearing LANEIGE’s new Silk Intense Lipstick, expressing the “All Eyes On Me” impact. The new Silk Intense Lipstick comes in diverse palette of 30 vivid shades, ranging from pinks, nudes, corals and reds to less conventional colours. Each of these colours are rich and vibrant, with an intense colour payoff. Of the 30 shades available, two shades belong to a more unique colour family – Exotic Yellow and Forest Fantasy. 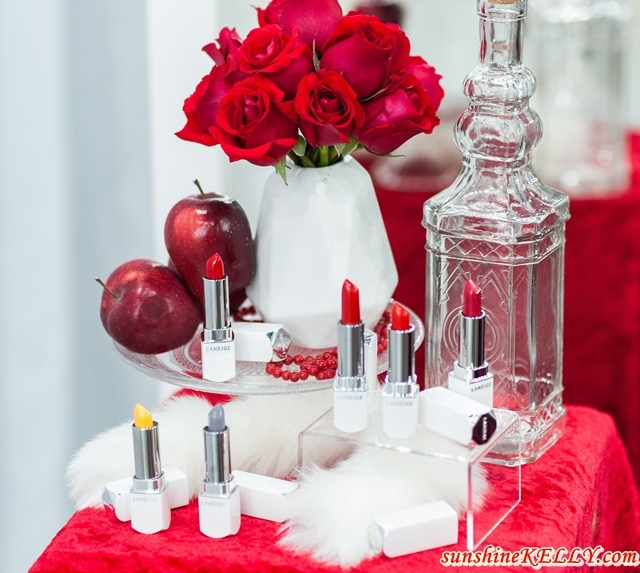 The yellow and purplish grey lipsticks can be used with any of the other colours as a mixer to create a different shade. With these two colours used as a mixer, the Silk Intense Lipstick comes in 30 base shades and can be combined to create up to 90 different colour blends. Most Asian women are concerned about skin tones. We prefer brighter skin tones and seek products that are able to mitigate reddish or yellowish skin tone, uneven or dull skin tone, blemishes and acne scars. Hydration and moisture plays a fundamental role in skin brightening. White Dew is LANEIGE’s patented moisture whitening product based on holding water in the skin to brighten skin tone. Having better skin tone is definitely #missiondewable. Melanin formation can be controlled in two forms – first, by regulating differentiation of keratinocyte (hydration whitening); second, by regulating movement of water in skin cells (moisture whitening). The secret behind White Dew is to control melanin, as most skin tone concerns are normally melanin-related. For example, brightness in skin tone is closely related to melanin formation, while melanin linked to yellowish tones is normally the main cause of skin dullness. A quick-lathering cleanser with a milky texture that is mild on the skin. This cleanser has a low viscosity and milky formula that lathers into creamy foam, to thoroughly but gently cleanse while leaving skin refreshed after rinsing. Its rich, creamy lather also works to thoroughly remove impurities and debris from the skin. A light and refreshing moisture whitening skin refiner that replenishes moisture while even out skin tone. This refiner’s light and watery texture that converts into water droplets when spread on skin allows for quicker absorption into the skin to effectively hydrate and improve skin tone. It’s a moisture whitening emulsion with a fluid-like texture that absorbs into the skin in a form that resembles water, to brighten and hydrate the skin. One of its ingredients, lecithin, forms a layer on the skin to lock-in moisture for long hours. This concentrated ampoule formula with Mela-vita Crusher, works from within the skin to effectively lighten spots and even out the skin tone for a bright and flawless complexion. Use 2 or 3 drops each time, day and night. Its condensed and concentrated formula instantly replenishes skin moisture, absorbing quickly to form a moisture film over the skin to lock-in the moisture whitening effect for long hours. It’s moisture whitening tone-up cream with a moisture-rich emulsion-like texture that instantly brightens yellowish and dull skin tone. This tone-up cream’s oil/water emulsion formula containing dispersed TiO2 delivers the tone-up effect without pigments or darkening, while its white emulsion formula instantly brightens up skin tone and provides rich hydration. This tone-up cream comes with a water drop puff for seamless application. This is a double-layered eye patch which brightens the dull skin around the eyes by promoting blood circulation with a warming effect around the W-zone, which is prone to freckles and blemishes. Its thin coated film fits well around the curves of the eye area, and enhances the delivery of active ingredients. This is a wash-off mask that removes dead skin cells and clears oxidized pores gently, yet effectively to reveal instantly brighter and more radiant skin. The full Laneige White Dew moisture whitening skin care range except the Original Cream and Capsule Sleeping Pack will be launched at all Laneige beauty counters and boutiques nationwide starting March 2017. The White Dew Original Cream and Capsule Sleeping Pack will be launched in July 2017. I love Laneige product! Hope to get on White Dew Original Ampoule Essence soon. I love the Laneige sleeping mask. It keep my skin look more refresh and moisture. I also own their lipstick.